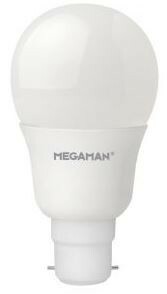 Megaman's GLS 10.5W LED bulb "Opal Classic" is a direct replacement for 60W incandescent bulbs in terms of both colour temperature and intensity, but with energy savings of up to 80%. The 10.5W GLS is DIMMABLE, delivers huge energy savings, can pay for itself in less than 1 year, and may last for up to 50,000hrs. Delivers 810lumens, and available in E27 or B22 base. Works with most leading edge models, please consult individual dimmer manufacturers for guidance.